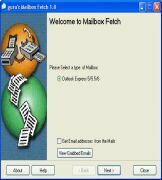 Mailbox Fetch is designed to extract attachments from popular email programs like Outlook Express, Outlook and Vista's Windows Mail . Currently the program only supports Outlook Express, MS Outlook and Vista's Windows Mail mailboxes. Other mailboxes will be supported soon. Instead of copying every attachment to the harddisk, you can use this program to extract all of the attachments automatically. Mailbox Fetch automatically downloads the internet image links given in the mail, and there by saving you time to check each mail and download individual links manually. This program is released as shareware. Before buying the full version, you are welcome to test the demo, afterwhich you can purchase the full version. Download Mailbox Fetch 3.0 now!